VISIT DENVER has more than 60 full-time professionals to help you find the perfect hotels, meeting facilities, restaurants and convention service firms. And all of our services are free! VISIT DENVER ranked as one of the Most Helpful Convention Bureau in the United States in the 2010 Metropoll study of meeting planners. VISIT DENVER has won all major industry awards for 26 years. 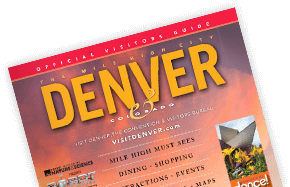 VISIT DENVER can provide you with brochures, maps, videos, photos, B-roll video, web banners, email newsletters and more to help boost attendance. At VISIT DENVER, we pride ourselves on exceeding expectations and providing a high level of service. VISIT DENVER continues to be the recipient of an ever-growing list of awards and recognitions, which represent some of the industry's top service awards such as Successful Meeting's Pinnacle Award; Meeting & Convention Magazine's Gold Service Award; Corporate & Incentive Travel Magazine's Award of Excellence; and Facilities Magazine's Top Destination Award. Denver has emerged as a first-tier convention city find out why from planners who like the venues, views, attention to detail and post-meeting options. A quick look at why Denver is a convenient, affordable and sunny place with top-notch hotels, venues, activities and day trips for convention-goers. Denver is serious about sustainability with a LEED Gold convention center, green hotels, bike sharing, airport with solar panels and Greenprint Denver plan. To say Denver's hotel scene is undergoing a renaissance is almost an understatement. Discover the newest properties and ones underway. Denver International Airport is one of the busiest airports in the United States. Here's a rundown on air and ground transportation options. With 300 days of sunshine and located at exactly a mile high, Denver's arid climate translates into mild temps, minimal precipitation and low humidity. Watch Denver in action with videos about what to do, beer culture and travelogues covering outdoor fun, shopping, dining, arts, culture, day trips and more.